Is one denomination bound for heaven? Home > 2001 > Authors > Bible Study > Church Issues > Church Issues Q&A > Lynnford Beachy > Newsletters > Questions and Answers > Salvation > September-01 > Is one denomination bound for heaven? First of all, we must have a biblical understanding of what the church is. The Bible says, “Ye are come unto mount Sion, and unto the city of the living God, the heavenly Jerusalem, and to an innumerable company of angels, To the general assembly and church of the firstborn, which are written in heaven.” (Hebrews 12:22, 23) According to the Bible, God’s church is made up of those whose names are written in heaven, in the Book of Life. There are many people who attend the Roman Catholic Church whose names are written in the Book of Life. 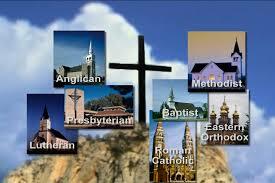 There are also many people who attend the Roman Catholic Church whose names are not written in the Book of Life. This is also true of the Baptist church, the Methodist church, the Presbyterian church, etc. Only those whose names are written in the Book of Life will enter into the kingdom of heaven. There is not a denomination in this world whose members will all go to heaven. If you are a part of a particular denomination, it will not guarantee that you will enter into heaven. Neither will being separate from a particular denomination exclude you from going to heaven. Although it is true that being a part of a particular denomination will not ensure that we will enter heaven, there will come a time very soon when being a part of certain denominations will cause us to be guilty by association, and will cause us to be lost. The Bible says, “Lay hands suddenly on no man, neither be partaker of other men’s sins: keep thyself pure.” (1 Timothy 5:22) It is possible to be a partaker of other men’s sins by approving of them. God said, “When thou sawest a thief, then thou consentedst with him, and hast been partaker with adulterers.” (Psalms 50:18) Paul wrote, “Happy is he that condemneth not himself in that thing which he alloweth.” (Romans 14:22) Allowing things to go on around you, and consenting to them, will result in becoming guilty yourself.